Making it Rain with Arduino! Arduino kits from Maker SHED arrived at my doorstep this week and today I finally had a chance to put it together. I bought a starter kit which comes with the main Arduino controller and a bunch of parts like buttons, LEDs, resisters, and bread boards. I ran through all the basic experiments in a day such as making LED’s blink, push button toggles, and performing IO over USB between the Arduino and computer. The Arduino software for creating programs is simple and really easy to use. In addition to the starter kit, I also purchased some shield kits which are basically expansion kits for the Arduino. I decided to build the LoL (Lot’s of LEDs) shield which mounts directly to the top of Arduino and provides visual feedback. 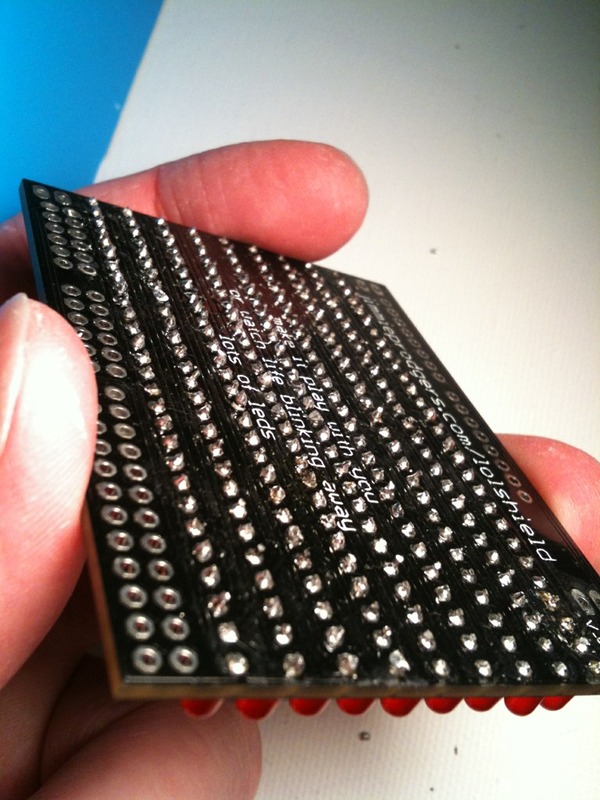 The back of the board shows many rows and columns of solder. 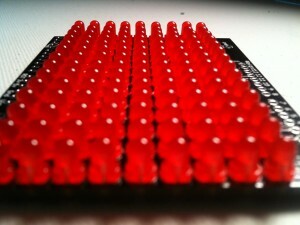 The LoL board has 126 LEDs arranged in a 14 x 9 rectangle. In order to put this thing together, I had to run out to Radio Shack today to buy a 40W solder iron, flush cutters, pliers, and of course solder. This shield requires soldering almost 300 connections! My soldering skills were a little weak at first, but after a couple rows it became much easier. It took me a couple hours, but I finally got every LED soldered and clipped. Look at the back of the board and all the drops of goo it required. The connections are very close together so you really have to be careful. I constantly worried about holding the iron for too long against the board which might change some of the underlying logic or even worse make the board unusable. 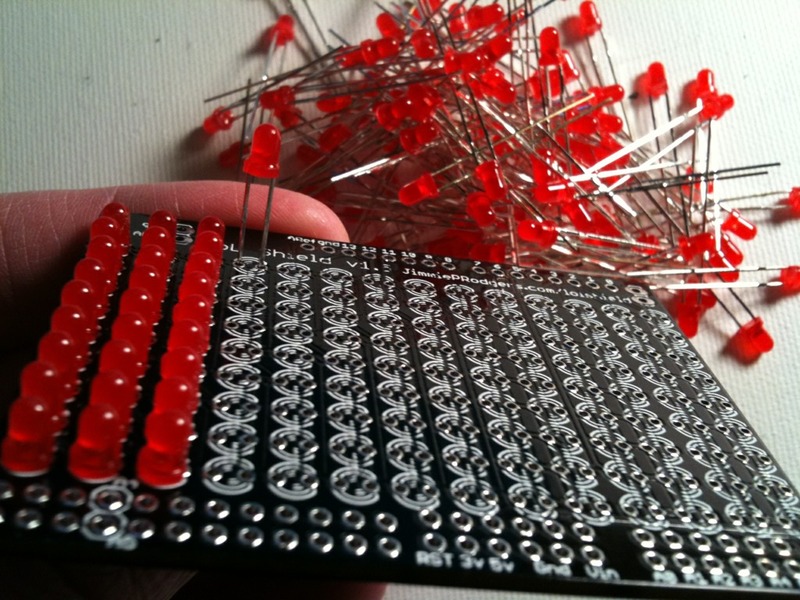 I also worried about shorting out pins from using too much solder. I don’t think I blinked much because I had to get up twice to get eye drops. 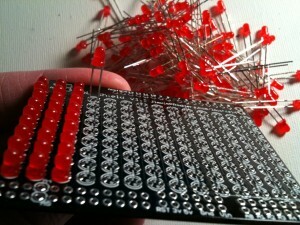 There is nothing like finishing up that last row of LEDs. I did a final inspection to make sure everything looked in order. I touched up a few places, adding solder where needed, and clipping where there was too much. The crop of red LEDs were aligned evenly and looked great. Now came the real test to see if it worked. I attached the shield to the top of the Arduino controller, plugged it into the USB port of my Mac, and then brought up the Arduino development environment. I went over to Google code and downloaded the LoL shield library. It took me a minute to figure out how to install the library but dropping it into your sketches folder under libraries/LoL did the trick. The compiler was now able to find the library and all the sample code compiled without error. I ran the basic test and was extremely relieved to see all the LEDs working. Building and coding the Arduino Lol Shield has been a lot of fun. My next goal will be to create a game of some kind. I know others have created Pong and Space Invaders. I’d like to come up with something different. Any ideas? This entry was posted in Arduino and tagged arduino, code, development, led, LoL Shield, rain, shield, uno on January 8, 2011 by todd.